The key is to understand the causes of this condition and to prevent injury. Swimmer’s shoulder is a musculoskeletal condition with gradual onset of symptoms that results from repetitive microtrauma/overuse. The onset of symptoms may be associated with impaired posture, glenohumeral joint instability, altered neuromuscular control or muscle imbalance. 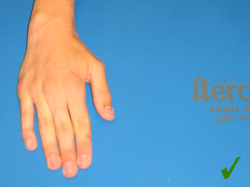 Additionally, training errors such as overuse or wrong techniques may also contribute to this condition. In extreme cases, patients with swimmer’s shoulder may also have associated soft tissue pathologies of the rotator cuff, long head of the biceps, or glenoid labrum, which may lead to mechanical impingement. It is important to develop symmetrical rotation of the trunk and hips in order to maintain a good body roll as you move through the water. The shoulders, trunk and hips should all rotate together. Excellent core strength is essential to maintain symmetrical trunk rotation. People who swim with a flat body, i.e poor body roll, put a lot of stress on the rotator cuff muscles as the arm tries to swing out of the water. The hand should always enter the water in a flat position and not the thumb first. Entering with your thumb first causes excessive internal rotation of the shoulder joint, thereby straining the rotator cuff muscles. Remember to lengthen your stroke by reaching forwards with a straight powerful arm, thereby enabling you to travel further whilst taking fewer strokes, a very efficient way to swim! 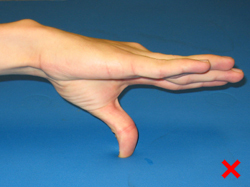 When the hand enters the water, the power produced from the rotation of the trunk, is used to propel the body forwards. The lats, pecs and core muscles are working hard at this stage. The leading arm at the front of the stroke should not cross over the midline of the body, but rather pull straight backwards. Poor cross-over of the arm not only causes the swimmer to produce a snake-like pattern of movement which is very inefficient, but also strains the rotator cuff muscles. Most of the power of the forward propulsion of the body during swimming is produced by the arm pulling through the water.Swimmers more often than not, pull through with a dropped elbow. Developing a pull through phase with a flexed, high elbow will reduce the strain on the shoulder muscles and labrum of the shoulder joint. 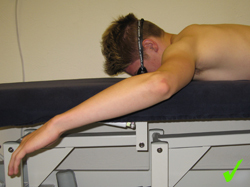 This position of the arm and elbow also encourages the big powerful mobilising muscles i.e biceps, deltoid and triceps to work efficiently.The most effective management of Swimmers shoulder involves a multidisciplinary approach consisting of a shoulder specialist, skilled physiotherapist and experienced coach. Early diagnosis and appropriate treatment will prevent the development of chronic shoulder problem in swimmers.